Children's first [milk] teeth are important because, they are being needed for chewing and speaking. They help to maintain space for the permanent teeth developing underneath them in the jaws. If the milk teeth are well looked after, then it is more likely that the second [permanent] set of teeth will grow into their correct position. The first permanent tooth is usually one of the four six-year-molars, so named because they appear around the age of 6. 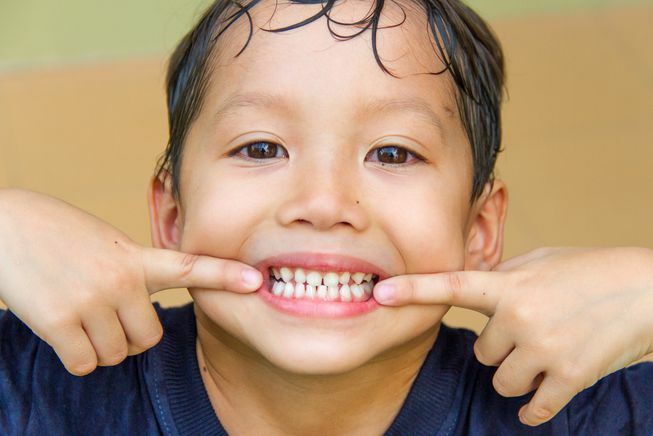 Molars are important because they help to shape the lower part of the child's face as well as determines the position of the other permanent teeth. 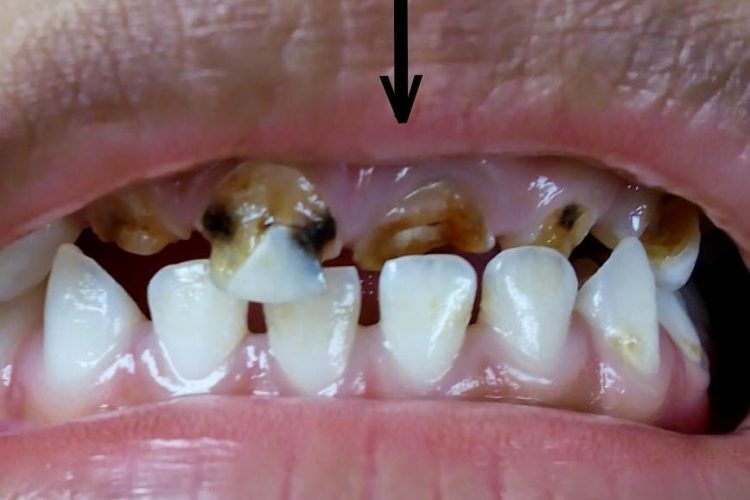 A Word Of Caution : The 6 year permanent molars are often mistaken as milk teeth and neglected. Permanent second molars usually appear around age 12. At that time, your child will have a complete set of teeth except for the wisdom teeth or third molars which usually appear between the age of 17 and 25. With your help, your child can have a lifetime of healthy smiles. A balanced diet is important for healthy teeth and gums. Children especially need Calcium to help build strong teeth (milk, cheese, etc.). Discourage sugary or starchy snacks. Snack in moderation and include beverages to wash the food particles off the mouth. Set regular snack times to avoid constant exposure to cavity causing foods. Seek early dental care for your young one. Begin oral hygiene when an infants first tooth emerges. Encourage good oral health and hygiene habits early. Have youngsters brush frequently with fluoride toothpaste. Teaching your child to maintain good dental habits is the beginning of good dental health. Proper personal care and regular visits to the Dentist can keep dental problems to a minimum. When should I start caring my child's teeth? 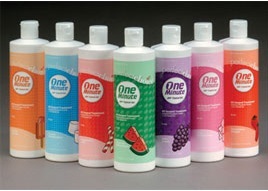 Oral care should begin soon after the baby's birth. Gums should be cleaned after each feeding. Ideally, your child's first dental visit should be by the first birthday. Your dentist will check for decay and other problems, teach you how to clean your child's teeth and identify your child's fluoride needs. By starting dental visits early, you will help your child build a lifetime of good dental habits. Yes. When babies are teething they often have sore and tender gums. The pain usually can be soothed by gently rubbing the baby's gums with a clean finger, a small cool spoon or a wet gauze. Generally child has a tendency to keep biting on something while teething. This might be a chance of infection and cause diarrhoea. Dental caries progresses if left untreated. First it starts in Enamel. In this stage food gets lodged in the cavity and a slight sensation might occur. It is better to get the cavity filled at this stage itself. Then the decay progresses to Dentin. In this stage there will be sensitivity. Still the cavity can be filled. Then the decay spreads to pulp. In this stage there is pain and the treatment options are Root canal treatment or Extraction. Finally it may lead to abcess and swelling extraorally. In this condition removal of tooth and draining the abcess is the only option. Yes. Eventhough they eventually fall out, milk teeth can get cavities and may need to be treated. 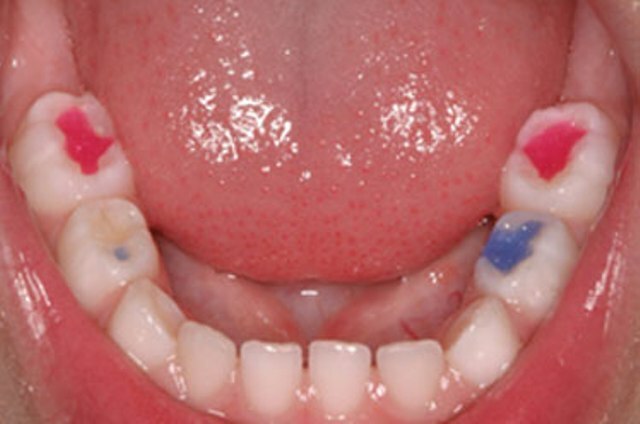 One serious form of decay among young children is Baby bottle Tooth Decay. Babies when fall asleep with bottles in the mouth - the sugar in juices or milk formulas can cause tooth decay, leading to multiple cavities (Rampant Caries), dental discomfort, and even tooth loss. What are the Filling Types for the KIDS? Any Filling material containing Fluoride is always better, as the filling releases Fluoride ions thereby, preventing further decay in the tooth. A Glass Ionomer , or a Compomer are Ideal Choices. Composite Restoration , a tooth colored one for the front teeth would also be an Ideal Choice. Now-a-days, Colored Bondable fillings (compomers) with Glitters have come with Fluoride releasing option , exclusively for kids. The available colors are Blue ,White, Pink, Gold, lemon, orange, green and so on. The Restorations done with this Material also has Better Strength than the Standard filling. For KIDS, If a Decayed tooth with pain can be Filled? No. A deep decay with pain cannot be filled. It has to be Root Canal Treated. After RCT, a Stainless Steel readymade Crown is given to the tooth. 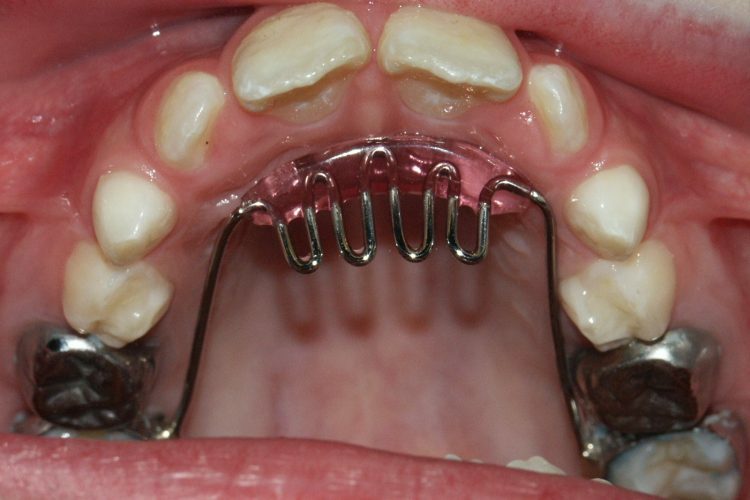 These teeth act as space maintainers and fall at the respective age. When to stop thumb sucking? Sucking is a natural behaviour for babies. Many infants begin sucking their thumbs or using pacifiers within three months of birth. Neither habit generally poses a dental problem if it is discontinued before the child's first permanent teeth erupt. If it continues we have to intervene. Either a bandage can be wrapped around the thumb or appliances with spikes can be inserted according to the delibracy of the habit. How can the dentist protect your child's teeth? Fluoride application is a single sitting procedure done once in every six months to make the tooth structure stronger and to prevent cavities. In some children the permanent tooth will erupt before the milk tooth is shed. In those cases the milk tooth has to be removed. We can even guide the tooth eruption by serial extraction and Easy braces (ready made braces available to align teeth). Even the jaw growth can be guided with myofunctional appliances. A milk tooth usually stays in until a permanent tooth underneath pushes it out and takes its place. Unfortunately, some children lose a milk tooth too soon. If this happens, the teeth beside it may move into the empty space resulting in lack of space for the permanent teeth, leading to crowding. This can be prevented by the use of Space Maintainers. This is more affordable. Also its easier for your child to keep teeth in normal positions with a space maintainer than to move them back in place with orthodontic treatment. How frequently do the kids need to have a Dental Check-up? For the Adults it is Every 6 months and for Kids upto 12 yrs it is every 3 months. As the milk tooth starts coming up by 6 months of Age and the Permanent teeth starts coming up by 6 yrs of Age upto 12 yrs, except their Wisdom teeth, they need frequent Dental check ups to identify any Problem with the Erupting teeth. If there is any, it can be corrected immediately.